Carmen may just be the hottest thing in opera since Salome slipped off that seventh veil. But is George Bizet’s doomed heroine driven by fate, as is suggested in a recurring motif in the music, or feminism? The word “liberte” comes up in the libretto almost as much as it would in a production of “Les Miserables.” In addition, San Francisco Opera’s latest “Carmen” knows a thing or two about “liberté.” A native Israeli, Hadar Halèvy comes from a country where women serve in the army alongside the men. Nobody – especially the jealous, love-obsessed Don Jose – is pushing this babe around. Halèvy, who was slated to sing in the second cast of “Carmen,” which runs through Dec. 9 at the War Memorial Opera House, stepped in for the ailing Marina Domashenko to sing in the first cast. Kate Aldrich, this year’s Richard Tucker Career Grant recipient, will pick up the slack. Domashenko — whose signature role is Bizet’s fiery gypsy — is considered by some to be the premiere Carmen of our time. Maybe so but Halèvy sets the stage ablaze with her interpretation. Her voice is full, rich and perfectly placed. She’s pretty, graceful and even dances a bit in the spirited Seguidilla. As an actress, she goes from mischievous to seductive to defiant in the blink of an eye. Alas, she is unlucky in love and deserves a sexier Don Jose. Marco Berti, who will share the role with Stuart Skelton, has an impressive resume but his voice, wobbly at the top, is less than imposing. Furthermore, he looks like a sausage stuffed into his soldier’s uniform. (Fault the costume department for that)! Brooding, sulking and moody through most of the action, he finally comes alive in the opera’s tense, dramatic final scene, at last becoming a man to whom the fickle Carmen might have been be true. Alas, it’s too late. She’s already dead. Carmen’s other guy, the dashing bullfighter Escamillo, is more worthy of her. Not only is he something of a hero, according to the plot, but in the hands of good-looking baritone Kyle Ketelson, he is a lover as well. His famed “Toreador Song” in Act Two left a little to be desired vocally but, as usual, brought down the house. No bull: Escamillo can do almost anything he wants and the crowd will love him anyway. The secondary women’s roles were exceptionally well-sung. 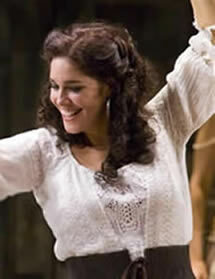 Ana Maria Martinez lent a clarion soprano to the music of Micaela, the girl Jose left behind, and Adler Fellows Rhoslyn Jones and Kendall Gladen were fine as Carmen’s girlfriends and fellow-smugglers Frasquita and Mercedes. Whoever is in the cast, Bizet’s tuneful score is the star of this show and the San Francisco Orchestra, with Sebastian Lang-Lessing on the podium, did it proud. (George Cleve will be in the pit for alternate performances). From the brassy, bright opening which evokes the fiesta spirit of the bullring to the lovely, lyrical Act Three Prelude, the orchestral passages were stellar. Ian Robertson’s chorus, abetted by the adorable kids of the San Francisco Girls and Boys Choruses, lent vocal weight to the crowd scenes. Although Jean-Pierre Ponnelle’s production is beginning to look a little tired (the smuggler’s lair looked suspiciously like the Act One barracks with a large hole cut into it and they both resembled the outside of the bullring), director Laurie Feldman Santoliquido kept things moving at a brisk pace. There was nary a dull moment in the three hour and 40 minute evening, except perhaps during the two intermissions, which might have been cut from 25 minutes and still provide patrons with time to sip their coffee and champagne and negotiate the lines to the restrooms.